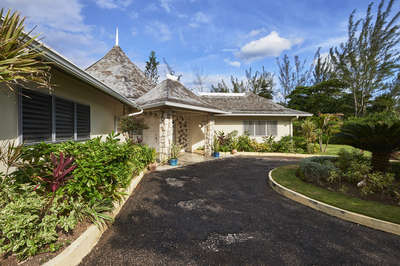 Wag Water is a charming three bedroom villa overlooking the sea and forming part of the historic Prospect Estate. The combination of a spacious living room, equipped with modern conveniences such as satellite television, VCR, telephone and stereo system, along with an extensive covered veranda, with ample space for lounging and dining, provide the best of both indoor and outdoor living. Each of the air conditioned bedrooms has its own private bathroom. The tropical garden has a pool, sun deck and winding stairs leading to a seaside sundeck. Swimming is not recommended at Wag Water due to currents and rocks. The famous Reggae Beach is located just one quarter mile away for sandy beach swimming. Discounted greens fees at Sandals Upton Golf Club. Discount or priority booking of Dolphin Cove attractions.